"Often I seem to be alone, but really I have Jesus as a companion. I try to deprive myself of everything, but instead I find all. I shun all the pleasures of life and I happen on One so great that I am utterly happy. I am always on fire with love, and I always want to love more. I suffer, and never have enough of it. I long to live and I long to die. I experience love, but my lover I do not understand. I cannot fathom him. Being thus ignorant, still I can sense that he is an immense good, an infinite good: Jesus! "I wish that my heart could beat, that I could live and breath only for Jesus. I wish that my tongue could utter no other name than that of Jesus; that my eye could see only Jesus; that my pen could write only about Jesus, and that my thoughts could soar to nothing but Jesus. I have often wondered where on earth there might be something on which I could center my love but neither on earth nor in heaven do I find any such thing but only my beloved Jesus. "Paradise is waiting for us. If living for Jesus on earth makes us so happy, what must heaven be like where we shall see him and all his infinite greatness, goodness and beauty. I hope for mercy from Jesus, mercy for me and for all poor sinners. If I could, I would atone for all of their sins and also for mine. "Let us recall, my dear sister, that we are disciples of this Jesus who suffered so much. It is not enough to look at the cross, or to wear it, we must carry it in the depths of our heart. Together, let us visit Jesus crucified. Let us look at him; he is lifted up on the cross. If Jesus is nailed there, let us not complain if we must stand at his feet. My poor Jesus! I wish I had a heart composed of all the hearts that love you most, so that I might show you my sympathy and help you. However, all the powers of my poor body, and all the love of my miserable heart, I consecrate to you. May it never be said that we would fail Jesus and leave him alone on the road to Calvary. Let us stay with him, not only as far as Calvary, but to the cross and death. Let us together rush to the cross, to new crosses. Let us put our arms around them and say: Oh holy cross, if we remember the immeasurable love with which Jesus greeted you, we will never part with you again. "I am the fruit of your passion, Jesus, born of your wounds. Oh Jesus, seek me in love; I no longer possess anything: you have stolen my heart. I always say to myself that to love is to suffer; you give the cross to the one's you love. Treat me as your Father treated you. Jesus, compel me to drink the cup of your sorrows to the last drop: give me a little at a time. "So Jesus, do not leave these poor sinners to themselves. I am willing to do something. You died on the cross; make me die too. Since these sinners are your sons and daughters, do not abandon them. Jesus, I want them all to be saved. If you desert them, there is no hope. Must not I be the one to suffer for them? Then arrange it so. You have so many sinners, but so few victims. 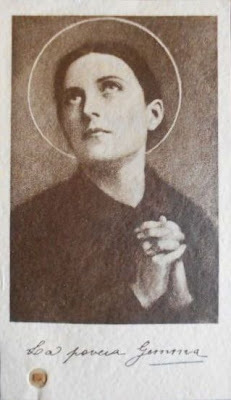 Webmasters note: In the upcoming week I will be publishing more of the Divine Office of Readings for St Gemma Galgani, (May 16). The text is a spiritual treasure and along with the beautiful readings and prayers in honor of St Gemma, it also contains the "Decretal Letter" of Pope Pius XII for Gemma's canonisation, which is a testament to Gemma's life, relating such things as "....she practised all of the theological and moral virtues on a heroic scale, and we can say that her whole life was spent in a continual exercise of virtue." -So stay tuned, there is more to come! -I would like to give special thanks to Fr. Michael and Laura for kindly providing the text. Thank you for posting, it's amazing to hear her words to Jesus. I'm blessed to have Gemma as my Patron Saint, I can relate to some of her words and I pray I can love Jesus like that! Love reading about this amazing Saint everyday! Love praying to her everyday!